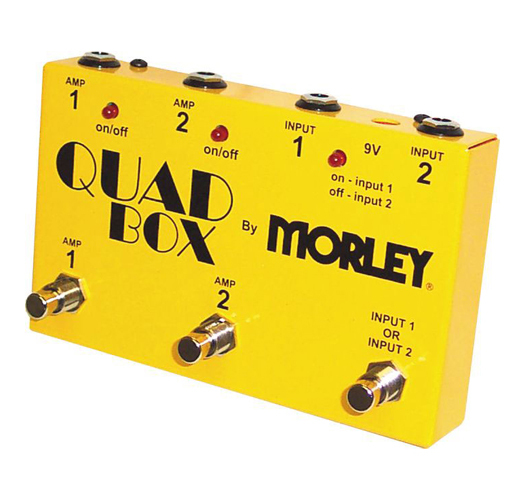 The Morley Quad Box Guitar and Amp Switcher is a handy switching device that allows easy control of two guitars and two amplifiers. Select between either of two guitars with the tap of a footswitch and select or combine any combination of both amplifiers. Conventional ABY boxes allow control over two guitars OR two amps but not both. The Quad Box allows for more flexibility by allowing quick access to two guitars AND two amplifiers without cumbersome and complicated Midi switching systems. Although the Quad Box was designed with guitarists in mind, it can be used anywhere an easy-to-use and cost-effective switching system is needed. LED lights show you which amp(s) and/or guitar is on/off. True bypass design prevents signal loss or tone change. Powers from optional Morley power adapter or one 9v battery.